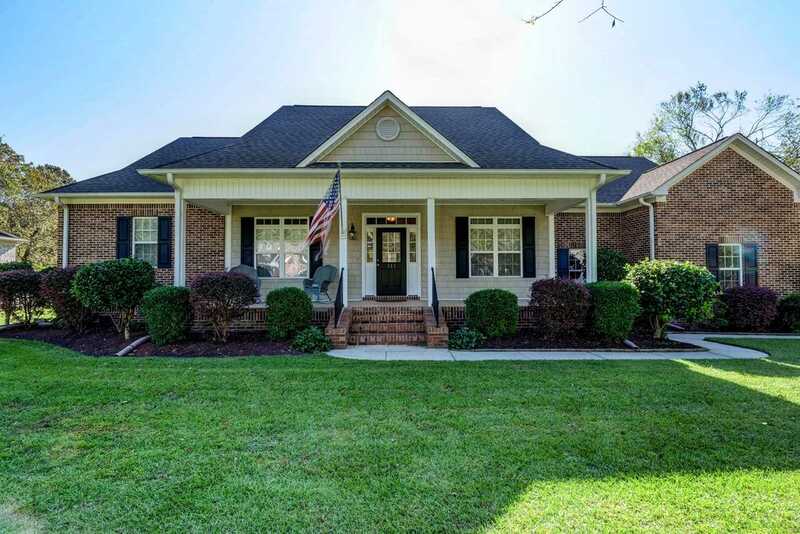 All-brick split-bedroom home on a large lot with beautiful oak trees, a deck, & storage shed in the back yard. Large porch & oversized garage with freshly epoxied floors & a workshop/storage room. Real hardwood floors. Living room features a fireplace, built-in bookcase, high ceilings, tons of windows (copious natural light thru-out home), & an attached heated/cooled sunroom. Spacious kitchen with granite counters, stainless-steel appliances, & a pantry. Private master suite includes a sitting room that could also be used as an office/nursery. Master bath features dual vanities, 2 walk-in closets, an all-tile shower, & Jacuzzi tub. 3 guest bedrooms have walk-in closets. There is so much storage in this house, even the laundry room has multiple cabinets & a separate sink. It's a must-see! Lot Size: 0.6 Acres / 26136 Sq. Ft. Directions:From Wilmington, take 133 to Paul's Place. Make left. Go 5.2 miles. Make left onto Pine Village. Follow in through gate and house is on left. SchoolsClick map icons below to view information for schools near 283 Pine Village Drive Rocky Point, NC 28457.